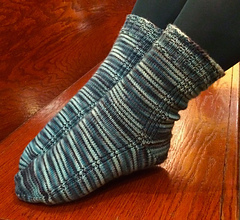 Sometimes yarn is a bit busy for a complicated stitch pattern, but one doesn’t want to knit a completely plain sock. 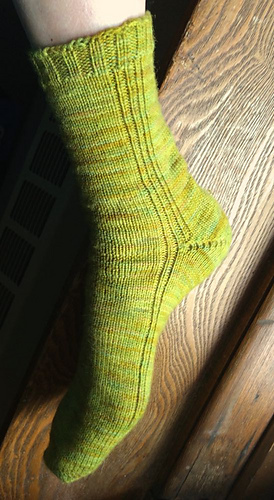 (Or sometimes an intended recipient won’t accept a complicated stitch pattern…) Completely plain socks sometimes aren’t as snug to the feet as one would like. Thus, this pattern: almost plain, but not quite. 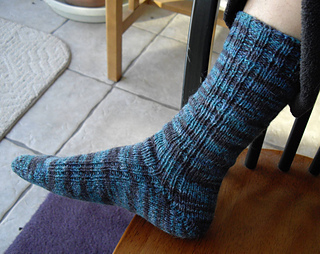 These socks can be knit in any of three gauges: 6 stitches/inch, 7 stitches/inch, 8 stitches/inch. Instructions for each gauge come in three sizes (S, M, L). 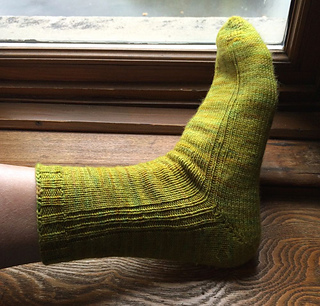 Because the socks are made toe-up, they can be made in any desired tallness, from ankle height to knee-high. 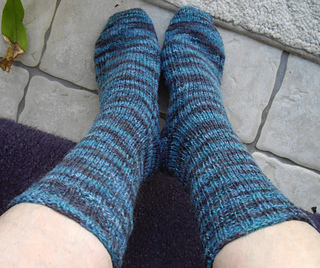 The only stitches needed are knit and purl and an increase stitch. The pattern includes pointers to tutorials for Judy’s Magic Cast On, short row techniques, and Jeny’s Surprisingly Stretchy Bind Off.